ATB dares to be a repeat offender. ATB -- also known as André Tanneberger, the once almighty German dance producer who, in recent times, has adopted a pop influence into his music (as is clearly seen by the lack of funky grooves in his album "Trilogy"). He was indeed a powerhouse of music for a long time, with a string of popular hits such as the classic trance anthem "9PM (Till I Come)", the just as swingin' follow-up "Don't Stop", and a slew of others. 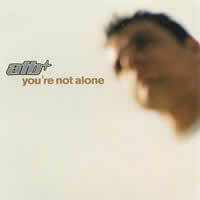 One of his more popular tunes (at least in his native Germany) is 2002's "You're Not Alone", from the album "Dedicated". A cover of a song of the same name by Olive originally performed in 1996, it actually doesn't stray far composition-wise from Olive's version, which was also somewhat dance-oriented. However, it retains the simple solitudinous feeling created within Olive's staple track (which ended up being their highest-charting track). Featuring the vocal talents of Roberta Carter Harrison from the Canadian band Wild Strawberries, the Airplay Mix of "You're Not Alone" starts out sounding a bit more down-tempo than most ATB singles before this, but soon morphs into a standard dance track. Aside from some rolling snares, there initially appears to be nothing special to this song, but the choral instrumental part is very full and enticing, even if using some unusual minor keys in the process. However, if you've heard Olive's version, there probably won't be much new to enjoy here -- even the main choral instrumentation is far too similar! Perhaps this is a strong indication of its faithfulness. The Airplay Chill Mix is slightly less powerful than the regular Airplay Mix, but seems to take out any areas of downtime, leading to just a shortened version overall. If you're an ATB music fan who doesn't like any filler or guff, the Airplay Chill Mix is probably your safest route to happiness. Rising Moon feels like the direct descendant of "You're Not Alone", using similar instruments and an overall common atmosphere, while still managing to be its own player in the game! It is definitely a chill-out style track that, regardless of its "Rising Mix" label, is suitable for listening during a relaxing romp through the forest or during one of your late-night lay-downs with a loved one. Finally, there is the 2nd Clubb Mix. Where is the first Clubb Mix? Was it not worthy of our ears? Hmmm. Either way, the 2nd Clubb Mix is not particularly spectacular either, feeling more like an extension of the Airplay Mix with a few distinctive changes, including a new slightly breakbeat-oriented drumline, the occasional vocals without synths behind it scenario, and the implementation of a different synth sound for the build-up portion that reminds me a little too much of pretty much any Love Inc. song ever composed. Interestingly enough, the first half (the build-up) sounds like a different song, but then it jumps back into the chorus vocals and all becomes familiar again. Nevertheless, I cannot go without saying that this version would not be as suitable for the club (or 'clubb') as one might think; there are too many quiet points with a lack of energy. Unless ATB expects the dancefloor to have pre-scheduled rest breaks during the play of this song, he is sadly mistaken as to what a club mix should contain: no barren moments, just wild energy and danceability! Based on what I've heard of Olive's original version, this is so close, it may not be worth hearing twice. I'm not too sure which is the superior rendition, but since I have a strong rapport with the music of ATB, I'd probably choose his version. Either way you go about it, hearing "You're Not Alone" in any form is a good idea, as it's a very simple song that serves its primary purpose of being just a song you can listen to and enjoy without thinking too much. And if YOU like this song, you're not alone!